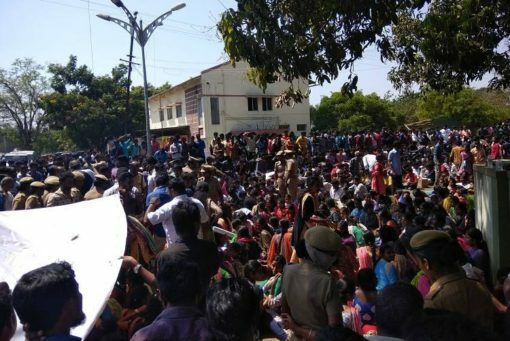 A storm of protests and outrage has broken out in Tamil Nadu in the fortnight since the case of serial sexual assault and extortion in Pollachi in Coimbatore district came to public attention. Leaked video and audio recordings, police missteps, and alleged political interference have fuelled the protests. On March 13, according to Kaviya Sabapathy, Girls’ Sub-committee Convenor for SFI Tamil Nadu, students from 150 colleges and universities in the State boycotted classes to carry out demonstrations. For instance, Coimbatore SP R. Pandiyarajan, who was initially responsible for the investigation, actually revealed the name of the survivor in a press conference. Both the Pollachi police and a Government Order reportedly also revealed her name too. Though the IPC clearly protects survivors from such disclosures, the repeated instances of such revelations are being viewed as a means of intimidation to prevent women from coming forward and complaining. “This is gross injustice. Just this one act will function in keeping other women from coming forward, threatening them effectively into silence. Severe action needs to be taken against him”, says P. Suganthi, State General Secretary for All India Democratic Women’s Association (AIDWA). In her view, the police have deliberately impeded the investigations. In a press statement, Henri Tiphagne, Executive Director of People’s Watch, Madurai, condemned the disclosure and called for serious action to be taken, “It is worrisome that none of the higher police officers including the Additional Director General of Police(L&O), Inspector General of Police, Coimbatore and Deputy Inspector General of Police of Coimbatore range have not taken any disciplinary action against Mr. Pandiyarajan known to the public for revealing the identity of the victim. Secondly, Mr. Pandiyarajan by stating that there was no “political influence” in this case has raised more doubts and concerns about the nature of the investigation.” Tiphagne also alluded to an earlier incident of misdemeanour by Pandiyarajan, in 2017 when he was a Deputy Superintendent. A widely publicised video shows him slapping a woman protestor at a demonstration against TASMAC (Tamil Nadu State Marketing Corporation that has monopoly on liquor sales in the state.) People’s Watch has registered a complaint against him with National Human Rights Commission, which has been transferred to the Tamil Nadu State Human Rights Commission. The SHRC has attached this complaint to their suo-motu complaint, according to Tiphagne. These events have led to massive outrage in the State. Opposition parties and civil society organisations have mobilised strongly on the issue. The protests intensified after an AIADMK worker, A. Nagaraj, was reported to have assaulted the brother of the survivor. Nagaraj was expelled, citing ‘actions that run contrary to the beliefs and aims of the party’ in a statement co-signed by Chief Minister Edappadi K. Palanisami and Deputy Chief Minister, O. Paneerselvam. However, opposition parties accused the AIADMK of protecting the suspects. On March 12, a DMK-led protest at Pollachi resulted in the arrest of MP and Women’s Wing Secretary K. Kanimozhi. SFI had also organised protests on the same day. Most of these organisations have also expressed scepticism of SP Pandiyarajan’s claim that there is no “political connection” to this issue. Makkal Needhi Maiam, in a press release, stated that the Women and Children Welfare Wing Co-ordinator, Sri Priya rallied together more than 300 “social activists” at Pollachi to submit a petition to the Sub-Collector’s Office demanding, “to take severe action against the culprits, take necessary measures to prevent the identity of the victims being revealed and to punish those who spread the identities of the victims immediately.” Party President and Founder, Kamal Haasan reportedly filed a complaint at the DGP’s office in Chennai. Speaking to Newsclick, Kaviya demanded strong punishment for not only the four accused but also all those involved in the racket. She also sought protection for the survivors. “We can convert the courage of that one woman, into the courage of all the survivors; we can convert it into the courage of all the women of this state. We will fight for this until they get justice,” she said. AIDWA will be organising protests on March 15, in Pollachi and all district headquarters in the State. They are trying to bring together student organisations, youth federations, and trade unions for joint mobilisations on the issue. The SFI Tamil Nadu’s Girls’ Sub-Committee is planning a hunger strike on March 17.